RMA Surveyors Ltd are proud to announce they have been accepted for membership of the Faculty of Party Wall Surveyors. RMA Surveyors Ltd have always acted as competent party wall surveyors, and are pleased to reinforce this by accreditation from this prestigious organisation. RMA Surveyors Ltd will assist the Faculty in maintaining the highest standards of professional practice in the field of Party Wall Surveying. RMA Surveyors Ltd will be continue to act professionally in accordance with the Party Wall etc. Act 1996 on all party wall matters. Whether they be acting for an adjoining owner, building owner, or for both as an agreed surveyor. RMA Surveyors Ltd are pleased to be part of an organisation whose membership includes the most eminent practitioners in Party Wall matters. If you have a Party Wall matter you need to discuss contact RMA Surveyors Ltd, who will be happy to assist. In addition to property surveys, RMA Surveyors Ltd undertake Defect Specific Reports. Each written report provides a clear, comprehensive and professional opinion regarding a particular problem (or ‘defect’) within a building. In recent months, RMA Surveyors Ltd have visited a property in Thatcham to inspect a sagging roof, a site in Didcot to investigate cracking and building movement and a property in Hungerford to assess a damp issue. Defect specific investigations and reports encapsulate the specific materials, construction and associated issues surrounding a specific building defect. Reports can be provided in a formal written report or in a letter or email format depending on the client’s requirements. 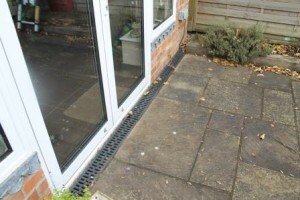 Specification for reinstatement and an estimate for repair costs can also be included. If you have a concern regarding your property, get in touch for advice. Call us on 01635 579208 or complete the enquiry form. As chartered surveyors, RMA Surveyors Ltd are members of and are regulated by the governing body RICS (Royal Institution of Chartered Surveyors). As such, any client can be guaranteed a high professional standard of inspection and report. We undertook a building survey of a mid-terrace cottage in Sonning Eye, Berkshire. The property was identified as being in a likely flood area. 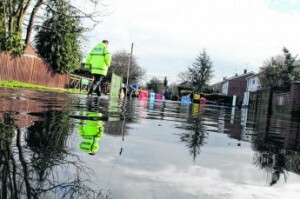 The current vendor reported that although the lane near the property had regularly flooded, there had been no incidence of flooding during the occupation of the property since 2006. 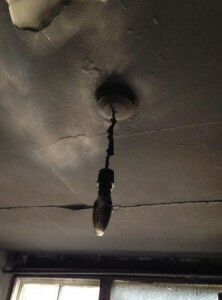 We highlighted this to our client and advised that they should check with their insurance company that they would be able to obtain adequate building and contents insurance. Given the location of the property, there was likely to be an additional premium relating to flood risk. The client did undertake these additional checks and whilst waiting for this and other legal checks to be undertaken the weather of the recent winter deteriorated and heavy rainfall unfortunately led to the property flooding. It appears in this case that the client had a lucky escape. Flood reinstatement works can often take a long time, as we have experienced in overseeing the project management works of properties that have flooded in the past. It is now quite possible that since the property has so recently flooded this will have affected any insurance policy to incoming owners. If you have any queries relating to flood damaged properties or require us to undertake flood reinstatement work, please get in touch on 01635 579208 or complete the form below. 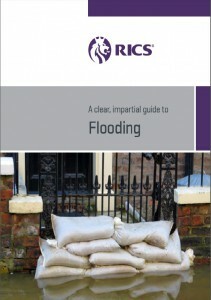 The Royal Institution of Chartered Surveyors has issued helpful advice in the wake of the recent flooding throughout the UK. A copy of which can be downloaded here. Unfortunately, for many, the flood waters have far from receded. Reports of more rain this week, and the potential for rivers to rise further, is unwelcome news. Once flood waters do eventually dissipate the process of reinstatement can be a long one. These five steps chart the process back to normality. If your building is insured against flood damage and you have been seriously affected, you will usually have a loss adjuster appointed who will deal with your claim on behalf of your insurance company. They are the main point of contact in regards to the claim, and will make the decisions as to what can and can’t be allowed under the policy. A loss adjuster should undertake an initial visit between three and five days from receiving notification of a claim. This may be longer in peak levels, such as now. In claims where the cost of reinstatement to your property is likely to be expensive, a project manager with specialist building knowledge is often appointed. The project manager is usually a surveyor, and both terms are used interchangeably. It is their role to specify the extent of the necessary remedial works, send the specification to different contractors to get the best price (often referred to as a competitive tender), appoint the contractor and oversee works through to completion. They will liaise with both you and the loss adjuster at all critical stages of the building reinstatement process. Some loss adjuster companies often seek to appoint their own in-house surveyors to project manage. The loss adjuster’s fee is usually set very low; profits are therefore generated through their in-house surveyor’s fees. Their in-house surveyors will only ask ‘approved’ building contractors to quote for the work. The building contractors sometimes pay these large loss adjusting companies a percentage fee for each project they successfully procure, in order to remain on the ‘approved’ list. Because of this, we have found some loss adjusters from some large loss adjusting firms can be obstinate in approving the appointment of anyone other than their in-house surveyors. When an independent surveyor becomes involved, the loss adjuster’s company does not generate any additional fees. It is very important to know that you are free to appoint your own independent Chartered Building Surveyor to act on your behalf. You are in no way obliged to use a surveyor appointed to you by your loss adjuster. It is your property and you decide who works on your behalf. Some in-house surveyors working for some large loss adjusting firms are overworked, juggling over forty projects at any one time, and over seventy projects in peak crisis periods; whilst covering a wide geographical area. These in-house teams are often not regulated by a professional body such as the RICS. Flood waters can contain sewage, waste and the accompanying bacteria and disease. At the same time as appointing a surveyor your loss adjuster should appoint a restoration company to assist in the initial clean up. They will remove all soft furnishings and flood damaged contents and take an inventory of flood damaged items. These items will be covered under your contents insurance and will be treated as a separate claim from your buildings insurance. The restoration company should also install fans, dehumidifiers and heaters to assist the drying of your property. 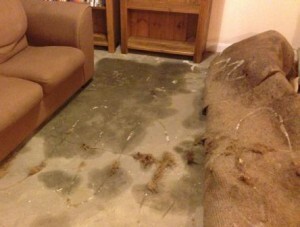 As well as the obvious water damage to the visible elements of a property, unseen damage may also have occurred. For example, all service installations should be thoroughly checked and any voids, such as those in timber stud partitions should be exposed, to allow these areas to thoroughly dry out. Damage can also occur to other elements of the property while the property is drying out, due to the high humidity levels and differential rates of drying to timber elements, caused by dehumidifiers. Plaster often needs to be removed from walls, where it has been contaminated with bacteria, soluble minerals and salts in the ground water. A building contractor is also frequently appointed at this early stage, to strip out such items as plasterboard, kitchen units and other elements to assist the drying of the structure. This stage can take anything between two weeks to over two months, depending on the extent of damage and the approach to drying adopted. The restoration contractor will return frequently to monitor drying and empty dehumidifiers. They will provide regular updates to your surveyor and loss adjuster. While the property dries out, the surveyor will provide a schedule of works detailing the extent of the reinstatement required. They will provide a cost estimate of works to the loss adjuster. This can take a week to ten days. The schedule of works will then be issued to a few different building contractors. A two to four week period is usually required for the contractors to return a price (or tender) for works. Once tender returns are received the surveyor will report back to the loss adjuster, making a recommendation as to which building contractor should be appointed. When the loss adjuster has agreed the costs the project manager will then appoint the building contractor on your behalf. You may already be in temporary alternative accommodation or need to move out of your property whilst repairs are in progress, which will be a matter of negotiation with the loss adjuster. There is usually a mobilisation period of around four weeks from appointing the building contractor, allowing the contractor to plan resources and labour. Reinstatement works can then begin. This can take anywhere between six to eight weeks on a typical domestic claim. The whole process can take much longer where the building is larger or more complex. For example if a building is listed, approvals will be required from the local authority, which can take eight weeks from the date the application is processed. The surveyor will oversee the contract. Providing valuations, issuing instructions, certifying works as they proceed and agreeing works are completed satisfactorily. The surveyor will report back to the loss adjuster at key stages agreeing interim payments be made to the contractor. The work should be undertaken under the framework of a formal building contract, such as the JCT minor works form of contract. A contract defines the duties of you (the client), the contractor and the surveyor. The reinstatement process can be long and involved. Many factors can come into play that delay or frustrate the process, particularly where there are so many claims being processed concurrently. In our experience it is better to have an experienced Chartered Building Surveyor appointed to steer you through this lengthy and sometimes frustrating process. If you need the assistance of a qualified and experienced Chartered Building Surveyor please call on 01635 579 208 or contact us via our contact page.